If you typically wear a ‘Key 3’ outfit of top, bottom, and layer – you probably already know it’s easy to change the whole look simply by changing the layer (or, even easier, the fabric). Janice of the Vivienne Files recently suggested a basic wardrobe of classic knits, tees, shirts, slim pants/ jeans. Here’s her post on it. And my post on possible patterns. Janice’s only ‘layer’ was a denim shirt-jacket. Which made the whole wardrobe look ultra-casual. 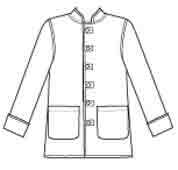 Very easy to change the style of this garment group by changing the jacket. Here are some of the many options. Soft cascade styles, short drape (McCall’s 6444), or long drape (McCall’s 6084), depending which flatters your body shape. Other casual styles, such as hoodie (McCall’s 6614), or quilted (Butterick 5532). More fitted, such as notched collar blazer (Palmer-Pletsch McCall’s 6655), or collarless (Palmer-Pletsch McCall’s 6441). These are all ‘modern classics’. Angie at You Look Fab suggests the blazer version as a fashion formula for this season. Try lace instead of leather for a biker jacket this season. ‘Military’ is emphasised in the November issues of UK Elle and In Style. Easy to use a double breasted jacket and add lots of gold buttons, including on the sleeves. More arty-creative : asymmetric (Sewing Workshop Riviera), or oversized (Sewing Workshop Ikina). Janice at The Vivienne Files herself suggests a similar variety of jacket choices in a post on alternatives to the blazer. All these layering possibilities would look good with a tee and slim pants/ jeans/ skirt. No wonder those are considered ‘basics’ ! If, like me, you like a top with a collar (more flattering with my body shape and hair style), take a little more care with neckline co-ordination. I think a mandarin/ band collar would look better with many of these jackets than a shirt collar. If you like this season’s bow collar blouse, I think a blazer or other classic V-neck or slightly lowered round neck (examples in Simplicity 2154) looks best. To go with the rest of the basic wardrobe in the colours Janice suggested, use tan, grey, navy, black, or your accent colour. For jackets that will last for seasons, use solid fabrics. For jackets that look ‘winter 2012’, use unusual tweed, brocade, brightly coloured fake fur, leather or leather trim. Which layer is your style ? Pick your favourite pattern with this style, and make it in casual, business, and special occasion colours or fabrics. See Imogen Lamport at Inside-Out Style on changing the level of refinement of your clothes by changing the fabrics. Even a hoodie can be multi-purpose ‘sports luxe’ if made in quality fabric. 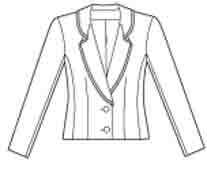 Or alter your jacket using trims and embellishment. Or, even more adventurous, Marcy Tilton’s Jackets CD. Personally I’m happiest in a shirt-jacket, though definitely not a blue denim one. Only one pattern – hmm, that I would have difficulty with 😀 In winter I wear thicker fabrics and more ease for multiple layering. And my layers are where I like the interest of my outfits. There are luscious choices by named designers in the shirt section at Vogue. And over 2,000 vintage patterns on Etsy ! Or if you have many moods, make one of each jacket style 😀 and add some vests in a similar range of styles. What’s your pick from all the possibilities ? Yet more comments on how a pattern like McCall’s 6519 can be a good basis for building a core wardrobe. – the interest and usefulness of wardrobe patterns with 5 rather than 4 items. And some other patterns with more items (post here). – a few comments on how the shape elements of the different garments in this pattern work together (post here). This post is about how shapes fit together for layering : is one layer large enough to be comfortable over another ? I’m not attempting to say everything there is to say about layering of all styles ! ‘Ease’ is the amount the garment is bigger than the wearer’s body measurements. The most basic is ‘movement ease’, the amount that needs to be added to be able to wear the garment at all. For wovens, this is usually either 2 inches/ 5 cm or 4 inches / 10 cm at bust level. Some people prefer a close fitting basic style. Other people like their basics a little looser. Some personal pattern drafting instructions produce a basic block with 2 inches ease, some produce one with 4 inches. Check whether the drafting adds 1/2 inch or 1 inch to the quarter measure at bust level. If you’re going to draft your own pattern block from scratch, look for a method which produces the basic ease level you prefer. As knit fabrics have stretch, they provide inherent movement ease. Even so, some people like loose knits, some people like no ease. Very close fitting garments made from very stretch fabrics (swimsuits, leotards) may even be designed with negative ease (cut smaller than the body). So pattern making books have separate basic pattern blocks for knits and body fitting clothes. Different basic blocks for fabrics with different amounts of stretch. In the simplest fitting shell, ‘movement ease’ just means enough room to breathe. You may need more room for real movements. For example, my sitting hip measure is about 4 inches larger than my standing hip measure. 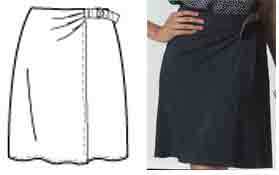 Many skirt and pants patterns have 2 inches ease at hip level. In those patterns, I need to go up a size, to add another 2 inches of ease. So I can wear that style without straining the fabric. This isn’t a problem with the pants of McCall’s 6519 as they are very loose fitting, with hip ease of more than 9 inches. It could cause problems with sitting down in that wrap skirt, and I would probably make a muslin to check. If you are an active person, and like to be comfortable, you may find you need a larger armhole and more fabric at elbow and knee. And you probably know you only like some skirt styles, because you can walk and dance freely in them. 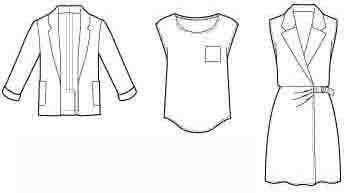 Then add on ‘design ease’, the extra needed to give the garment the shape and style that’s wanted. 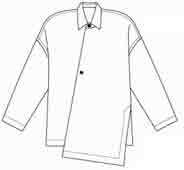 This affects whether a garment is close fitting or very loose. The BMV ease table shows total ease, movement ease plus design ease. So ‘design ease’ includes ‘layering ease’ if need be. Make sure there’s enough room to put one garment on over another. Best to have at least 1 inch/ 2.5 cm extra ease for every additional layer something needs to be comfortable over, including a lining. This applies to knits too, if you want them to be comfortable. So it might not look very good, but if you were cold you could wear all three 3 layers at the same time ! 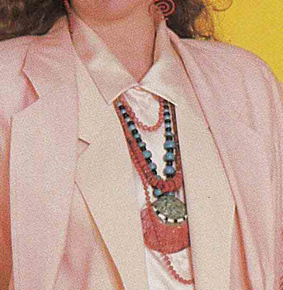 In this McCall’s 6519 pattern, dress and top are both sleeveless, so the problem of layering the jacket over another sleeve doesn’t arise. If you want to layer one sleeve over another, then the outer armhole and sleeve need to be larger too. 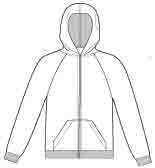 It’s also easiest if all layers have the same style armhole : all fitted, all cut on, all raglan, all drop shoulder, etc. Most armhole shapes work over fitted, but not the other way round ! How to add more styles when starting from one pattern ? If you’re ready to try a little pattern altering, you don’t have to go straight to a full-scope professional-training pattern-making bible. There are many simpler sources of advice to use as a starting point. Am planning a post listing some of them. Or if having ideas for capsules and small wardrobes is the point you get stuck at, look at The Vivienne Files or Polyvore. You may not share their ‘modern classics’ styling, but they’re full of ideas for combinations that make outfits and capsules. Continuing with comments on how a pattern like McCall’s 6519 can be a good basis for building a core wardrobe (see my previous past). It’s interesting to look at how a wardrobe pattern solves the problems of co-ordination. There are several. One is the shapes visually, such as : does a loose fitting jacket look good with loose fitting pants, what necklines go together. . . I’ll say a bit about this pattern here. There could be many more points about co-ordinating shape and style elements once you add other patterns to supplement this one. A possible topic for another post. Another issue is : do the shapes fit together for layering : is the jacket/ overlayer large enough to be comfortable over other garments ? Later post planned on this. Some wardrobe patterns co-ordinate shapes by using garments with few distinctive style elements. The garments in this pattern have some style interest but still co-ordinate. They do that by having some common style elements. Many people have difficulty co-ordinating neckline and collar shapes. What looks good, what is comfortable. . .
– shawl collar with notch on edge-to-edge front (jacket). – wide notched collar above wrap front (dress). – simple scoop neck (top). Notice that it’s quite easy to combine two notched collars if they differ in width, or how deep/ big the notch is, or how high the notch is on the body. In McCall’s 6519, an edge-to-edge jacket works well over a wrap style, so long as the wrap doesn’t have a lot of fullness. The simple top can be worn tucked in or out, for more or less formal effect. 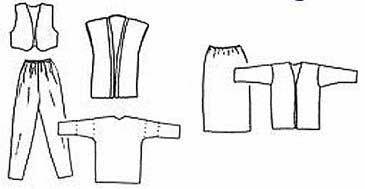 The skirt and lower dress are the same pattern pieces. Skirts and pants share a similar style element – pleats, which makes them good alternatives. The pants are very loose fitting (9-1/2 inches ease at hip level). So they look best with a not too large jacket. This one has 5-1/2 inches ease at bust level, semi-fitted by BMV ease criteria. I wrote a previous post on simplifying co-ordinates by using a limited number of shapes. Released pleats give a soft line (sewn down pleats have an more angular effect). Dress, skirt and pants all have these soft lines. The neckline of the top continues with the curves. Knits for dress and skirt also add softness. Although the jacket and dress notch corners are angled in the pattern, they are softer in the line drawings. You could use slightly rounded corners on the bottom of the front openings and the patch pockets. Or of course you can have mixed curves and angles. Which goes best with your body shapes and lines, your personality ? A pattern with curves and pleats like this might be better suited to someone who has soft lines in their face and body, or a gentler personality. If you have straighter more angular lines to your face and body, or need to look crispy efficient, you might prefer Butterick 5760. Angular styling, except for a little softening in jacket silhouette and lapels. A good wardrobe pattern for a core wardrobe ? Wardrobe pattern books are inspirational, but once you know how to make very simple changes, you don’t need a book to get an easy group of co-ordinates. Just start with a wardrobe pattern. 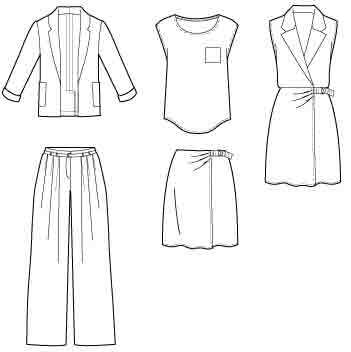 Most wardrobe patterns are for a ‘Core 4’: top/dress, jacket, skirt, pants. All items with a closely similar look. Wardrobe patterns which include patterns for more tops or layers are much more powerful as the starting point for a core wardrobe. Because they can give more variety of looks. I often like McCall’s wardrobe patterns. They’re rare but stylish. I find the recent one particularly inspiring, McCall’s 6519. This pattern doesn’t use the same style for both top and dress. It has two different underlayers. My focus here is general issues about expanding to a wardrobe from a single pattern, with this pattern for the examples. I don’t mean to imply that everyone should use this pattern as their starting point ! These styles wouldn’t work well for all body shapes or personal styles. Do you think these styles would look good on a Rectangle ? an Inverted Triangle ? an Hourglass ? With my small bust and large hips, these aren’t the best style elements for me. I don’t look good in flat notched collars, or boxy jackets, or full pleated pants. Close fitting knits don’t flatter me. And I need tunics and vests in my basic wardrobe. But this pattern makes a good foundation for thinking about wardrobe building. Modern styling and some interesting style elements. And hurrah, they’ve been generous : there’s a size 14 in the pattern envelopes for both larger and smaller sizes. And hurrah again, they’ve put the finished garment measurements with the website pattern information. McCall’s used not to do this. They made it in red, white and blue. But not flattering for all of us. So think of that as : accent colour, light neutral, and dark neutral. Top : 2 versions : one in dark and light neutrals, small scale print, woven; second in light neutral, solid, woven. Pants : 2 versions in the same 2 fabrics as the top. That makes 7 garments in all. Which combined without the jacket make 7 different outfits. Add the jacket to each, makes 14 outfits. Could be a good basis for ejvc’s Spring Capsule at Stitchers’ Guild. Or her ‘Lucky Seven’ idea (see here page 20, Feb 25). I think the key to the success of this McCall’s wardrobe pattern as a base for wardrobe building is that it includes 3 different tops. So different items in combination have different effects. Helped by accessories, you can go from business-like to casual with only a few garments. Not many patterns like this, but I have found a few. 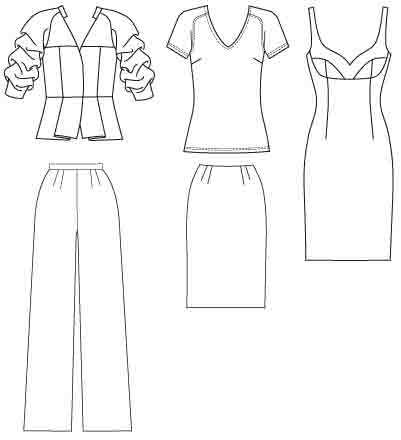 These ‘5 item’ patterns work well for Judith Rasband’s minimum ‘cluster’ of 5 garments (in ‘Wardrobe Strategies for Women’). If you prefer more classic styles, new Butterick 5760 has two overlayers. 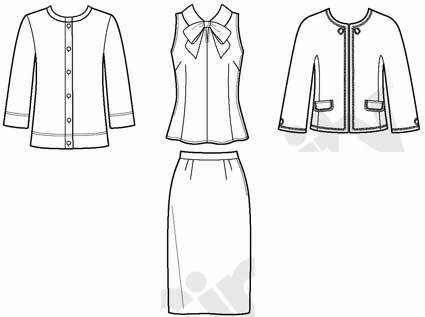 A notched collar princess blazer, jewel neckband knit cardigan, and band collar shirt/ dress, as well as skirt and pants. Wonder of wonders, rare in a wardrobe pattern – an underlayer with sleeves. In their look book BMV add a shell in an accent colour, and jeans. 8 different items in all, a good basis for a short trip wardrobe. (Shirt, dress, shell, formal and casual jackets, skirt, pants, jeans.) Add a ‘dressy’ top if the trip includes a special occasion. More ideas on styling for a business trip at this wardrobe site. Simplicity 1945 is a softer group for knits, this time with two underlayers. A raglan sleeve top with cowl neck, and a set in sleeve top with side drape front. Plus a simple jacket with cut on sleeve and cascade front. 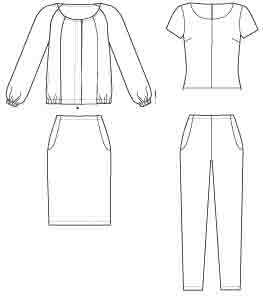 Pattern also has simple skirt and pants. 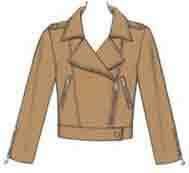 Add another jacket with a higher cascade collar, or a v-neck cardigan with banded neckline, for another group of looks. Or a light high-necked top to layer under those tops. . .
For a more ‘dramatic’ look there’s Vogue 8718 – with 2 very different underlayers (and a peplum jacket :D). The top with sleeves is a knit. 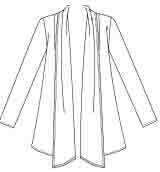 A version of the jacket with flat not ruched sleeves would add an ‘everyday’ look. If you like ‘vintage’, Simplicity 2154 is another pattern with a choice of overlayers giving a good variety of looks, a 60s ‘Jackie O’ style. Lengthen the top for a dress. Make another top without a bow. 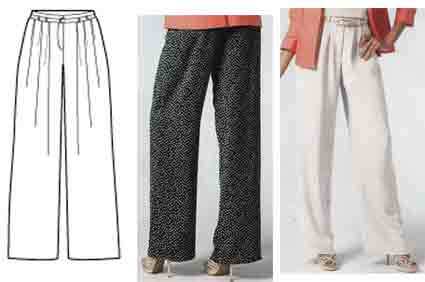 Add pants with a slightly tapered leg, perhaps Colette patterns Clover pants. This style is from the days when people rarely wore jeans (and pants were’t allowed in good restaurants), but capris would be acceptable casual. For the simplest of relaxed casuals, there’s Park Bench Central Park, which has three overlayers ! Finding a good pattern to start from isn’t the only question about building a wardrobe from a single pattern. I have other posts planned, on how the shapes and ease of the styles in the McCall’s pattern work together as co-ordinates. Then there are the very simplest strategies for adding items to make a minimum wardrobe. Change fabrics : see my post on Kate Mathew’s wardrobe plans. 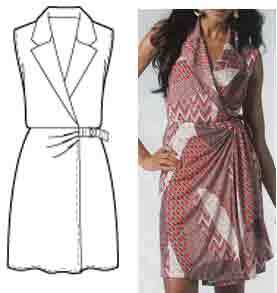 Change lengths : for inspiration look at patterns which include multiple sleeve and body lengths. See this post (also includes another 5-item wardrobe pattern). 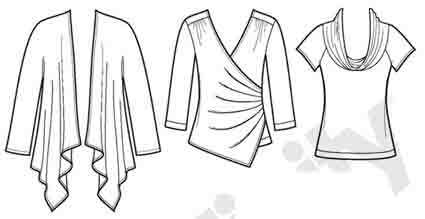 Or Butterick’s ‘The Cut Line’ patterns which work as tops, tunics, and dresses. Change pockets or trims : see that post again. Change necklines or remove collars : see my post.